Nusa Lembongan is easily accessible from Bali to the west and the Gili’s in Lombok to the east. If you are coming from Sanur then all boats leave from Hang Tuah road at the North end of the beach which is also where you will find the boat ticket offices and ATM. There are a few ATMs on Nusa Lembongan but they are used by scammers frequently so it is worth stocking up before heading over! If you are arriving on the public boats which don’t provide pick up and drop off service please make sure they are coming to Jungutbatu and not Mushroom beach which we can’t pick up from. All other boat operators like Rocky offer a drop off service to the hotel. For comfort and style, try one of the Rocky boats. This company offers a complete package and provides transport door to door throughout south Bali. Rocky Fast Cruises has a fleet of modern speed boats run by accredited captains and crews. They have 4 departures throughout the day and take care of your luggage for you, which makes life even easier! 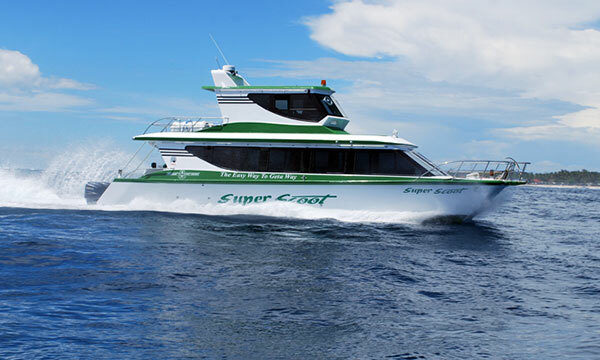 Rocky Fast Cruises include FREE transfer to and from South Bali. If you are staying in Nusa Dua, Jimbaran, Kuta or Seminyak pick up will be scheduled 2 hours before the boat departure. People in Sanur can relax a bit longer, pick is 1.5 hours before. For everyone enjoying surf and turf in Canggu, closest pick up point is in front of the Bintang supermarket in Seminyak. Great news, you may continue surfing in Lembongan also! Check out options on our What To Do On Nusa Lembongan page or simply ask us when here. Yoga and healthy lifestyle folks please gather in front of Bebek Bengli Restaurant in central Ubud but there is a per car supplement of IDR 250,000. Yoga Shack Lembongan is a holistic part of Big Fish Diving family! Landing to Bali from some worldwide destination? If your plan is to swing by Bali and arrive same day to Nusa Lembongan, please plan to land before 15.00 in order to clear immigration and customs. Rocky staff can pick you up right in time to catch the last boat to Nusa Lembongan and probably the most stunning sunset you have ever seen. 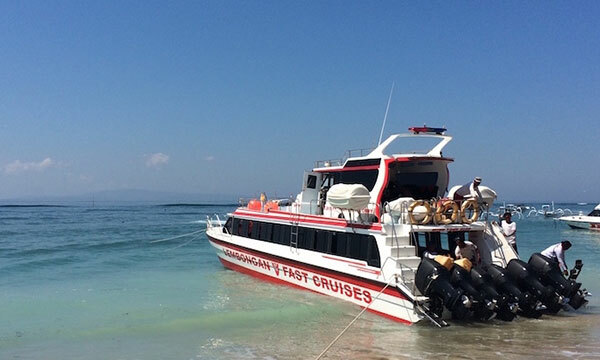 If you plan to visit both Lembongan and the Gili Islands in Lombok, Scoot Fast Cruises is by far the best option. A ticket from Bali to Gili Trawangan includes free stopovers in Lembongan, Lombok and Gili Air. Scoot also offer a free pick up and drop service at your chosen hotel. Their fleet has comfortable and modern speed boats, and also a high speed catamaran, all run by accredited captains. 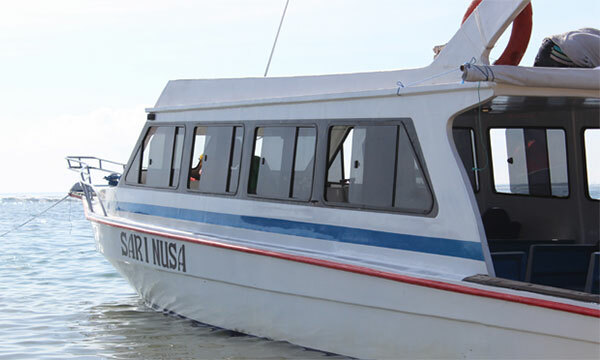 There is a local fast boat which leaves Sanur at 09:00, 12.30 and 16:00 and Lembongan at 08.00, 10:30 and 15:00 daily. It costs just IDR175,000. This takes approx 30 minutes and tickets can be booked from many accommodation providers on the island. Coming over to Jungutbatu village you generally do not need to buy tickets in advance (though this is perhaps advisable from July to September). The public speed boat is run by a group of Lembongan families, who take it in turns to run the service.